Clichéd. Predictable. Obvious 'will they, won't they' narrative. Soppy romance. 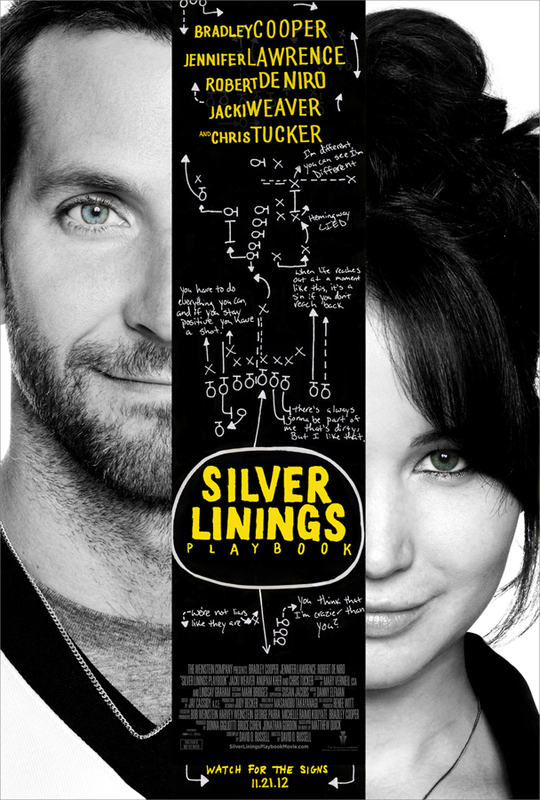 Yet Silver Linings Playbook is more than your typical rom-com. The film's central conceit is the mental stability of its leading couple. Newly released from a mental institution, Pat (Bradley Cooper) is determined to overcome his bipolar disorder, rekindle his marriage and reclaim his old life. This newfound determination gives structure and strategy to his life, but things take an unexpected tangent when he meets the depressive and dysfunctional Tiffany (Jennifer Lawrence). Can love drive you insane? Or does it keep you sane? The oddball, quirky feel of the film mirrors the protagonists, whose dialogue is amusingly hyperbolic yet makes a weird sort of sense. Pat is in the process of "remaking" himself, revelling in positivity and determined to find the silver lining in every cloud. Despite their bickering, the romantic philosophy of Pat and Tiffany is often more logical than the mindset of the supporting characters - Pat's superstitious father suffering from OCD (Robert De Niro), or weak-minded best mate Ronnie (John Ortiz) refusing to accept his suffocating marriage. Pat and Tiffany's conditions may be obvious to all but themselves, yet by comparison, they are no more insane than the rest of us and love is both the cause and effect. This may seem sickening, but the film is lifted by the excellent performances from the whole cast, in particular Cooper and Lawrence. Individually, they display the ticks and quirks of their character's conditions with sensitive and believable performances. Cooper is more than just a pair of pretty blue eyes, and after success in Winter's Bone and The Hunger Games, Lawrence proves her versatility as an actress. Together, the chemistry between them is palpable - love is the only therapy they need. The emphasis on psychology is slight, with love firmly at the film's heart, but it provides narrative depth that's matched by characterisation. Silver Linings Playbook is a film that urges us to make the most of now. It's an obvious sentiment, but by using typical rom-com tropes in a novel way, Russell's film is sweet and heart-warming without the schmaltz.